How would you like to win some SPRING CASH?? It could be your lucky Day!! I am so happy springtime is here! I don’t know about you but I am sooooo tired of snow. 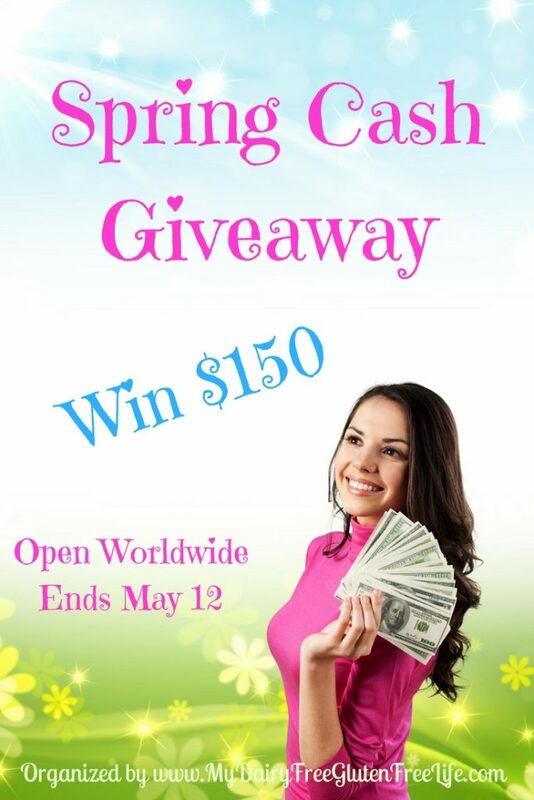 We are celebrating springtime by giving away Spring Cash! The winner will have their choice of Paypal Cash or an Amazon Gift Card. A great group of great bloggers is joining in this celebration of springtime! This giveaway is open WorldWide and ends May 12, 2017 at 11:59 PM EST. Disclaimer: This blog did not receive compensation for the published material in this post. No purchase required to enter this giveaway and there is a limit of one entrant per household. Void where prohibited. Odds of winning are determined by the number of valid entries received. The winner will be chosen by Random.org and will be emailed via the email address used to enter the contest. New winner(s) will be chosen if the original winner(s) has not responded within 48 hours of email notification. My Dairy Free Gluten Free Life is responsible for shipment of the prize(s). This giveaway is not administered, sponsored, endorsed by, or associated with Facebook, Twitter, Google, Pinterest or other social media outlets. The disclaimer is posted in accordance with the Federal Trade Commission 10 CFR, Part 255 Guides Concerning the Use of Endorsements and Testimonials in Advertising. I’d like to see more giveaways for Amazon.com gift cards, Paypal, national store or restaurant gift cards, kitchen items, food items, books, arts and crafts, and items for babies and children. I like all kinds of giveaways. I like beauty products, fashion items or gift cards, misc items like ice makers, coolers, but you can never go wrong with cash. Everyone can and will use cash. I enjoy all kinds of giveaways. I would like to see cash/Pay Pal, small appliances, electronics, and fashion (handbags, jewelry, etc.) giveaways. I like cash (Paypal) and/or Visa cards the most. Paypal cash and gift cards never go out of style! I love to see more restaurant gift card giveaways. I like giveaways for gift cards, home items and clothing. Anything baking related is great in my book – and what’s not to like about gift cards?!? I would love to see more giveaways for VISA or target gift cards! I enjoy any kind of giveaway but especially those with Electronics or money cards is nice! I like giftcards and home items. My favorite kinds of giveaways are cosmetics and gift cards. Just about any gift card or paypal giveaways are my favorite. I like giveaways with books or children’s products and reviews. I love gift card giveaways, techi giveaways and all kitchen appliances/ gadgets giveaways. Nothing at all wrong with cash giveaways!! I love cash and gift card giveaways, also giveaways with 2 or 3 winners! Any giveaways that involve any sort of cooking or food products…oh and Amazon cards :p Thanks! I love gift cards, Paypal and items for the home or kitchen. I love to see more gift card giveaways! I feel like I can splurge if I win a gift card because it’s only good for one place! I like cash and gift card giveaways.